Kent House Bed and Breakfast is a family run Bed and Breakfast and Lorraine and John Dineen will welcome you to their home. The Kent Bed and Breakfast is a gorgeous end of terrace Victorian Townhouse, built in the 1850’s originally as a Merchants Townhouse. In the past it has gone through many changes since then is now their home. The Bed and Breakfast consists of five comfortable cosy and charmingly decorated guest bedrooms, all en-suite. The house offers a nice garden and every morning you will get served a nice and tasteful breakfast with homemade bread. The perfect start to explore the city Cork and while staying at Kent House, you are ideally located to tour Cork City, the capital of the south of Ireland, how the locals call the city, and the surrounding area. 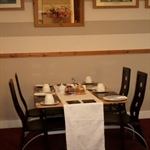 The Kent House Bed and Breakfast is not far away to the Railway Station, the Bus Station is 5 to 6 minutes walk and the City Centre is within 10 minutes walk. It’s also convenient for the ferry port and the airport. The Kent Bed and Breakfast is in walking distance to the English Market, where you get your fruits and vegetables as a snack, and St. Finn Barr’s Cathedral or the Crawford Art Gallery. Another day you can go to the Cork Vision Centre, St Ann’s Church, Shandon, Cork Butter Museum and The Cork Opera House or The Cork City Goal, if you want to know the Cork history and listen to Cork stories. The City provides for every tourist something, does not matter if you are here for a relax weekend, a week of adventure or a night out in the city. Visit excellent pubs, restaurants or a performance in one of the theatres. So come and stay in the Kent House Bed and Breakfast.